July photograph in the DMG 2019 Calendar: Bright outlook. Photo credit: Daniel Eggert. 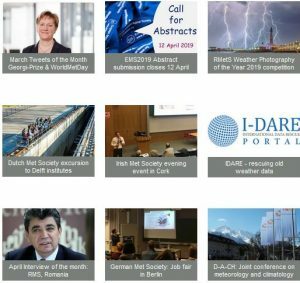 The German Meteorological Society (DMG) has produced a 2019 wall calendar on the theme of urban climate. It contains 13 wonderful colour photographs and comes in 2 sizes – large and postcard size. The photos can be viewed at https://meteorologischer-kalender.de/kalender/kalender-von-2019/. 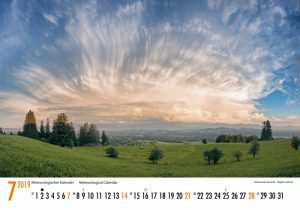 The proceeds of the sale of the these calendars will be used to support the German Meteorological Society’s aim of promoting interest in atmospheric processes and disseminating knowledge about meteorology; the calendar has been published since 1982. The front of each page features a spectacular photograph of a weather phenomena. The reverse side of each page provides easily understandable explanations of the weather conditions shown in the accompanying photograph. In addition, the reverse sides include short specialist articles and imagery relevant to the theme of the calendar. These articles are written in German and English. Photograph used on the front cover of the DMG 2019 calendar: Moonlit journey. Photo credit: Marko Korošec. This year the reverse sides of the calendar pages present various methods used to investigate urban climates. Topics covered in detail include urban heat islands, air pollution, wind conditions and the impact of urban greenery and urban water bodies on urban climate and rainwater management. Atmospheric processes can be depicted emotionally and rationally using mathematical and scientific methods to explain and describe them. In three examples, the meteorologist and artist, René Sauerbrei, shows how such depictions can be merged. 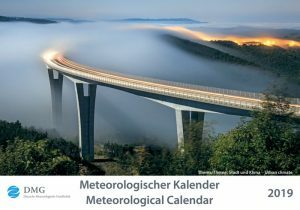 The calendar can be ordered at https://meteorologischer-kalender.de/bestellen/ or https://meteorologischer-kalender.de/en/buy/ and would certainly make a lovely gift.